Hope's Cafe: SGSG-2 Red Hens Toy Nanny Is Fabulous!! Wow, I have an absolutely fabulous product to share today that would make a perfect gift for a mom with young children! How many of you get frustrated while trying to transport your youngster's toys from the living room back to the nursery? Or maybe you're spending the day at Grandma's, and clean-up in the evening is the last thing you want to do? Yeah, I know the feeling well! That's why when I discovered this amazing product from 2 Red Hens, I knew I had to let you all know about it! I received a Toy Nanny for review, and this is one of the most ingenious products I've ever seen for mothers. The concept is fairly simple, yet it will be a great relief for mothers anywhere. 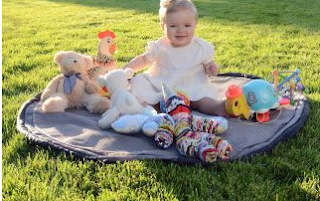 Basically, the Toy Nanny is a floor blanket, but it is so much more. Featuring 8 mesh pockets for storage of toys, a super-soft velour interior, and a water-resistant backing to prevent leakage, this should be on every mom's wish-list. Converts to tote bag for easy carrying! It is completely machine washable, so no fussing with special cleaning needs. 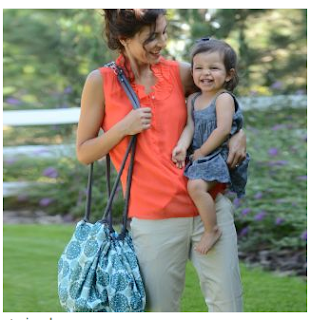 The Toy Nanny also converts into a carry tote, simply by pulling the straps along the side. So you can let Junior play outside, in the living room, at a friend's house...and clean up is a snap! Simply pull the handles, and carry all the toys back to the bedroom! Honestly, who wouldn't love a Toy Nanny?! Be sure to visit 2 Red Hens for other unique and beautiful gift ideas for moms! Disclaimer: I was not monetarily compensated in any way for this review; I did receive product for the purpose of review. All thoughts and opinions are mine; all quotes taken from the 2 Red Hens website. I was not required to post favorably about the product or company.